My Little Pony: Equestria Girls makes its TV debut today on The Hub at noon. The theme of practically every My Little Pony episode is right there in the show’s subtitle: Friendship Is Magic. This mantra only intensifies in My Little Pony: Equestria Girls, the Mane Six’s first foray onto the big screen (the 1986 release My Little Pony: The Movie featured a different flock of ponies, along with Danny DeVito). The gimmick of transforming the ponies into teenaged humans gives the show a new arena in which to play out its favorite friendship subject: the painful gauntlet of high school. At the end of MLP: FIM season three, Twilight Sparkle became a princess, complete with crown and Pegasus-like wings. Equestria Girls opens with a giant establishing shot that shows us we’re not in Ponyville anymore, but with Fluttershy, Rarity, Rainbow Dash, Pinkie Pie, and Applejack as they accompany Twilight Sparkle to a special Equestria princess summit. Unfortunately, the subversive pony Sunset Shimmer steals Twilight’s crown and escapes through a mirror portal into another realm. Twilight must follow her and retrieve the bejeweled adornment, and the stakes are high: The crown will give Sunset unprecedented power in the otherworld that upsets the elements of harmony, or something. For those keeping track, this is about the umpteenth time that Twilight Sparkle has had to perform a mission with the entire fate of the pony universe dependent on her little hooves. So Twilight goes through the looking glass, and, as the movie poster reveals, turns out human at the other end. She suspects the crown is in what she thinks is a castle but is actually a high school, where she encounters human versions of the other ponies. These girly incarnations seem to make up the main appeal of the short (72-minute) feature film, which is only a few songs and one amazing demon battle scene better than most of the MLP: FIM two-part episodes. 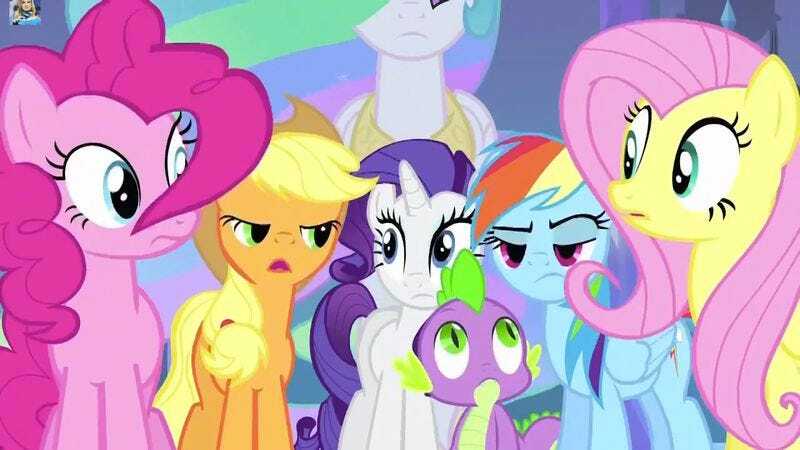 Interestingly, in the societal petri dish of high school, Twilight finds that her pony pals are not friends anymore: Fluttershy hangs with the eco-kids, Rarity with the fashionistas, Rainbow Dash is a jock. The song that unites all the cliques (“Time To Come Together”) sounds pitch-perfect for Radio Disney, but a few other clichéd tune montages (Getting the gym ready for the big dance! Getting the girls ready for the big dance!) will hype up the 6-year-olds while leaving their parents wondering why they have to watch some kids musically sweep up a gym yet again. But My Little Pony: Equestria Girls continues the appeal of Friendship Is Magic, as the heartening lessons of Ponyville—on friendship, leadership, morality, etc.—transcend its equine-dominated world. Twilight’s first day in the high school, even though it’s her initial attempt on two legs instead of four and she eats an apple without picking it up, is not that much more awkward than anyone’s overwhelming first day of high school. The obligatory mean girl turns into a succubus, because, really, why not? In the era of Justin Bieber, an evil spirit leading mindless drones of teenagers doesn’t seem that far-fetched. In fact, more than any other place in the universe, the dog-eat-dog world of high school could use the ponies’ friendship magic.